Turn your digital photo into a piece of art. Is there a better alternative to GMX-PhotoPainter? Is GMX-PhotoPainter really the best app in Image Editing category? Will GMX-PhotoPainter work good on macOS 10.13.4? GMX-PhotoPainter is a Digital Painting Software which enables the user to transform any image into an original artwork. Artists can start with an existing picture such as from a digital camera, scanner, or 3D rendering, and paint the brush strokes using the provided tools. 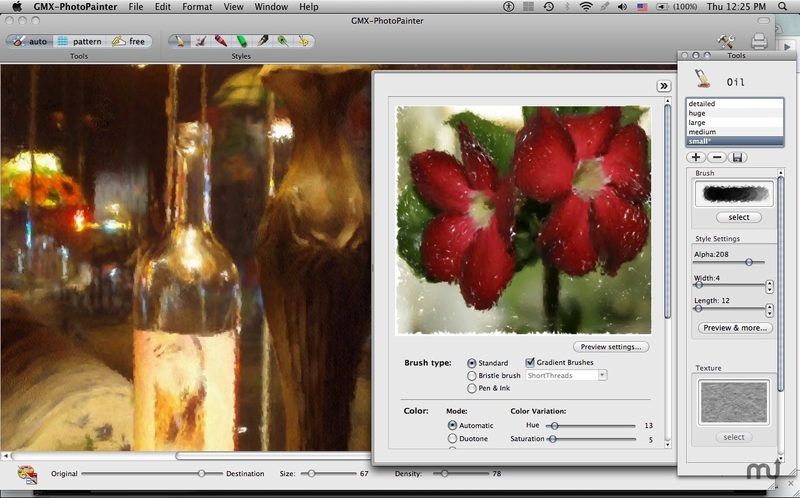 GMX-PhotoPainter can assist the user to automatically decide the brushstroke color, and direction or it can let the user to decide by themselves. GMX-PhotoPainter needs a rating. Be the first to rate this app and get the discussion started!